I know, dear readers, that you usually check out my blog for more Cleveland sportsy things and not so much the foodie things, but a girl can not live on the TGIFriday's Jack Daniel's grill menu alone. 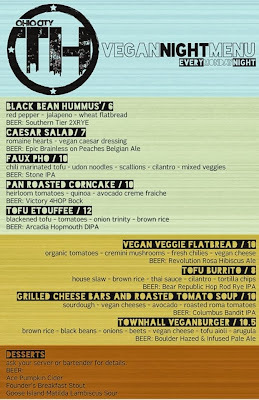 If you haven't checked out TownHall in Ohio City yet, their Monday Night Vegan menu is another reason to go. First, TownHall is a hipstery place - in the best possible way. Great beer and cocktail selection and tasty food in a warm environment. The staff is not pretentious or a pain in the hiney. Let's be clear for a second and I need to make sure that you know and understand that I am *not* a vegan. I'm not a vegetarian. I tried to eat like a vegetarian for a week and I think I made it to day three. I am about as much as a carnivore that you can get with out being a cave woman. I only add this because my vegan speak is not so good. The first things my friend and I tried off of the menu were both delicious. We snagged the black bean hummus and corn cakes. The black bean hummus was so good that I wanted to make a little sign and march around that said "Down with garbanzo beans" or chick peas or whatever you want to call them. I would have liked some crispy tortilla chips, but I get it...it is hummus. The flat bread worked just as well. The corn cakes were served on a more then generous helping of quinoa. The cakes were a little spicy, but with a bite of quinoa, it was perfect. As a barometer, you should know that I do not use any hot sauce and I don't get the excitement of sriracha. Any tinge of heat in my food makes me cringe and weep a little. So, there you go. I would without a doubt order the black bean hummus every day, all day, any time. I have no idea why it took so long for someone to create this bowl of tastiness. The staff said they recently changed the recipe, and friends, it worked. On to the main courses. My friend ordered the faux pho and loved it. She also added that it was spicy, and she has a palate of a normal person, so that means it would have killed me. I went safe with the roasted tomato soup and grilled cheese bars. Both components were fresh and well composed as they say on Top Chef. If you just dropped this off to me and said it was grilled cheese, I never would have known it was vegan cheese. The roasted tomato soup tasted so fresh and homemade that I envisioned buying a vitamix and making it myself. That will never happen, because they do it so well. I would hate to put someone out of a job. It was tasty, but I didn't eat too much because I think I ate too much quinoa. Eating my sandwich, all I could picture was a little bird that ate too much wedding rice and her stomach exploding. I decided to hedge my bets and save room for dessert. On to the desserts. We ordered two, the first being the vegan ice cream and vegan chocolate (carob or what have you) brownie. I was not a super fan. The ice cream didn't taste like ice cream to me, I know, duh, and I wasn't a fan of the brownie. To be fair, I'm not a fan of brownies in general. My friend thought it was great, so on to the next. 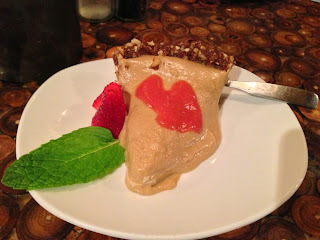 The second dessert was a creme pie that I am going to tell you out right was so good, I contemplated not sharing. Now for the ingredients - zucchini (whhaaatttt? 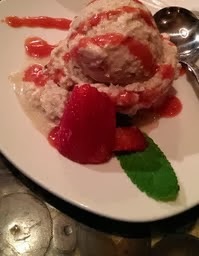 ), banana, paw paw, strawberry sauce and the most fantastical crust that they need to sell on its own. The crust was some nutty, cacao base of heaven. I'm very serious that they need to sell that crust by itself. I appreciated the attentive service and a server that really knew what she was talking about. There are few things I hate more in the world than trying to order something new and your server is as lost as you are. Probably the best part of the meal was meeting the raw food equivalent of the baker at TownHall. 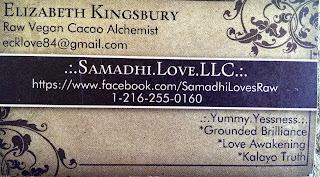 Samadhi (Elizabeth) came out and told us about what were eating and her enthusiasm for her recipes and giving people amazing, quality food was refreshing and honestly, a little disarming. She was so passionate and nice, I wasn't sure how to respond at first. If you go in on a Monday, you have to ask to meet her. I'm telling you, if you are at all interested in gluten free, raw food, vegan, etc, you would be doing yourself a disservice if you didn't meet her. After this meal, I realized that TownHall isn't some flash in the pan restaurant. When you have fresh ingredients and put out a quality product, you can't lose. Their patio is spacious and a great way to spend what nice days we have left. I hope that they enclose it or put heaters out there for the chilly weather. TownHall is a great addition to Ohio City, and I look forward to seeing you kids there. Have you been to TownHall? 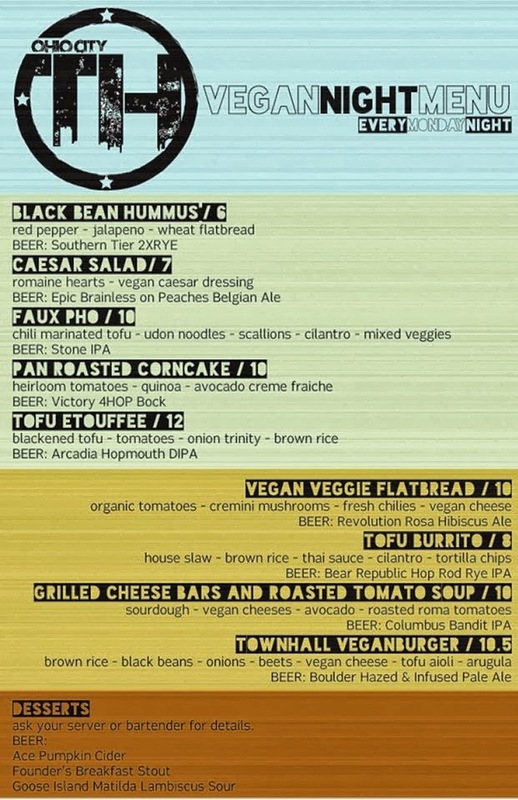 Disclaimer: The folks at TownHall invited me to try their Vegan menu. All of the words here are my own, let's face it the vegan kids are probably squirming at my descriptions. All of this sounds amazing. 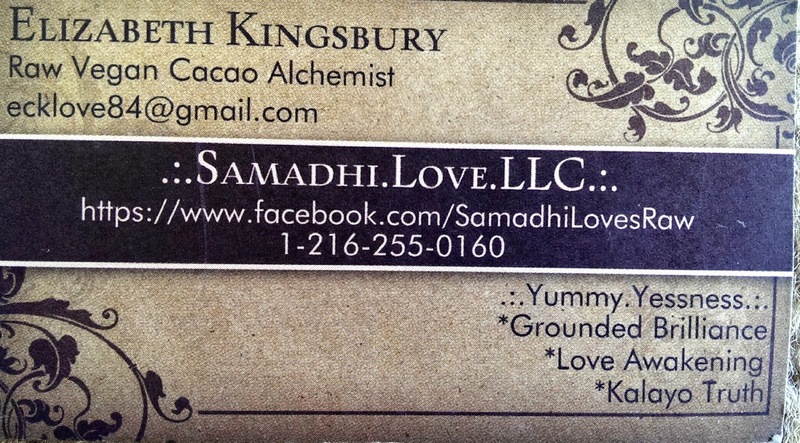 I'm checking out the Samadhi Facebook page now. Anyone who create such lovely baked goods already has my approval. Very cool - thanks for sharing this. I admit, that I immediately thought of you when I met her. She had such a weirdly cool vibe that I told her she needed to blog. Ha ha. But her healthy foods for sure. And she was at your Rock Hall yoga thingy. I'm vegan and very much appreciate your review! I actually haven't made it to their vegan night yet, but it's been on my to-do list.. your review got me even more excited to get down there! Adam, I am about as un-vegan as they come and I thought everything was delicious. It really made me consider that there are other choices on the menu that aren't meat. And that my friend, says a lot.